By 1934, the crooked street was still called synagogue street, because since 1798, was a simple synagogue with a small school room and an apartment for the teacher here. Even in 1899 wrote the head of the Jewish community, Sigmund Metzger, in which joy Christians and Jews celebrated here. Almost 40 years later, on 10.11.1938, the Nazis destroyed the building and threw prayer books and scrolls on the road. The neighbors were burning down still prevent, but the synagogue was demolished and the land sold. With the accession of Margrave Karl Wilhelm in 1709 and its economic approaches should be improved by facilitating the special payments and more recognition in the communities the situation of Jews slowly. 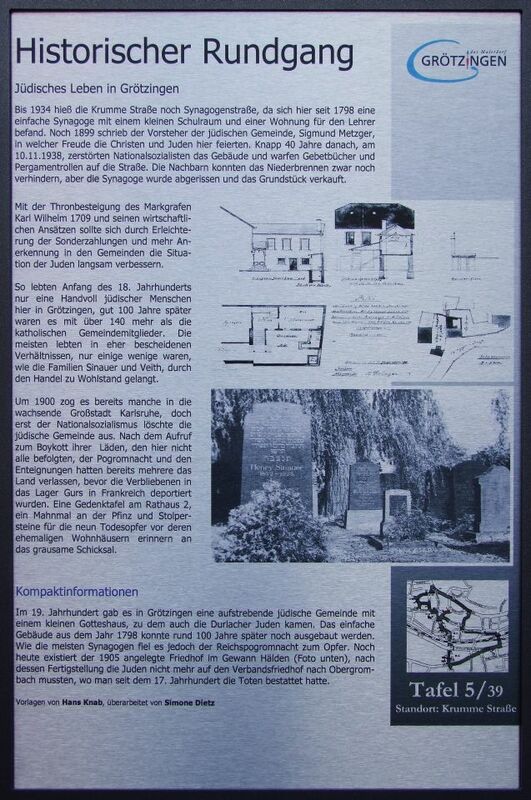 Thus lived the beginning of the 18th century only a handful of Jewish people here in Grötzingen, 100 years later there were over 140 more than the Catholic parishioners. Most lived in rather modest circumstances, only a few were as families Sinauer and Veith, passes through the trade to prosperity. Around 1900 he moved already some in the growing city of Karlsruhe, but only National Socialism extinguished the Jewish community from. After calling for a boycott of their stores, the not all obeyed here, the pogrom and the expropriations already had several leave the country before those who remained were deported in the Gurs camp in France. A plaque on the town hall 2, a memorial to the Pfinz and stumbling blocks for the nine deaths before their former residences reminiscent of the cruel fate.